News & Stories > Blue Sky Science > Is it possible to bring back extinct animals? Blue Sky Science: Is it possible to bring back extinct animals? Is it possible to bring back extinct animals? De-extinction, as it’s been termed, hasn’t happened in over 3 billion years of life on earth, so it will be an epic event if and when it happens. It can potentially be done using eggs and sperm that were carefully preserved before the last individual of a species died. Or it could be done by cloning carefully preserved non-reproductive cells. But these techniques can only be applied to species that have gone extinct very recently, in the last decade or so. For extinct animals, like the mastodon, that have been gone for hundreds or even thousands of years, it’s much harder. It would involve recovering fragments of badly degraded DNA from ancient specimens, and patching those fragments into the DNA of a close living relative. There’s talk about inserting bits of mammoth DNA into an Asian elephant’s DNA to produce a sort of mammoth-elephant hybrid, but it wouldn’t be a mammoth and chances of pulling it off are slim. And forget about bringing back dinosaurs. There just simply isn’t enough even badly degraded DNA to make that possible. De-extinction is still just an intriguing idea. So before attempting such an epic feat, we should consider carefully if it’s a wise move. Remember the ending of the sci-fi movie Jurassic Park? It didn’t end well. There could be many unintended consequences of de-extinction, especially if it involves a species that has been gone for a long time. So while scientists explore the possibilities, they need to also think very carefully before resurrecting an extinct species. Why do some animals go extinct while other species regenerate their populations? How did dinosaurs go extinct? How did dinosaurs evolve into birds? 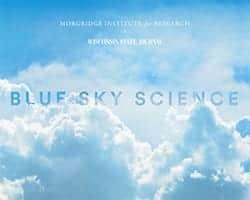 Blue Sky Science is a collaboration of the Wisconsin State Journal and the Morgridge Institute for Research. The questions are primarily posed by visitors attending Discovery Building events. As an independent research organization, the Morgridge Institute for Research explores uncharted scientific territory to discover tomorrow’s cures. In affiliation with the University of Wisconsin-Madison, we support researchers who take a fearless approach to advancing human health in emerging fields such as regenerative biology, metabolism, virology and medical engineering. Through public programming, we work to inspire scientific curiosity in everyday life.